Asam Pedas (Indonesian: Asam Pedas, Malay: Asam Pedas, Minangkabau: Asam Padeh, English: Sour and Spicy) is a Minangkabau and Malay sour and spicy stew dish. Besides being popular in Indonesia, it is also popular in Malaysia. 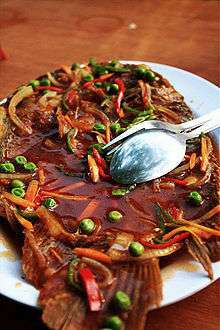 The spicy and sour fish dish is known widely in Sumatra and Malay Peninsula. This dish is part of the culinary heritage of both Minangkabau and Malay traditions, thus its exact origin is unclear. The Minang asam padeh can be easily found throughout Padang restaurants in Indonesia and Malaysia, and it also has become a typical cuisine of Malays from Jambi, Riau, Malay Peninsula, and also as far north in Aceh. However, the spices mixture, and the type of fish being used, might be slightly different according to their respective areas. The main ingredients in asam pedas are usually seafood or freshwater fish. They are cooked in asam (tamarind) fruit juice with chilli and different spices. The cooking process involves soaking the pulp of the tamarind fruit until it is soft and then squeezing out the juice for cooking the fish. Asam paste may be substituted for convenience. Various vegetables such as terong or brinjals (Indian eggplants), okra and tomatoes are added. Fish and seafood; such as mackerel, mackerel tuna, tuna, skipjack tuna, red snapper, gourami, pangasius or cuttlefish; either whole body or sometimes only the fish heads are added to make a spicy and tart fish stew. It is important that the fish remain intact for serving so generally the fish is added last. 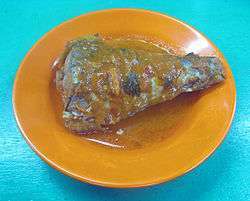 In Indonesia, the most common fish being cooked as asam pedas is tongkol (mackerel tuna). Kaeng som is the Thai version of asam pedas. In Bengal, India there is a similar dish is called Macher tak (sour fish). 1 2 Donny Syofyan (24 November 2013). "By the way ... I just can't live without Padang food". The Jakarta Post. ↑ "Kaeng-som, a Thai culinary classic". Wikimedia Commons has media related to Asam pedas.